How about a Software Clicker which can automatically click your selected window?. Does that sounds interesting or to add more, you even do not need to worry about focus on the spcified window. You can just set the Window Clicker on some defined window and do your own work, the Window Clicker will keep on clicking the specified window. The Window Clicker has been designed for Windows Operating Systems such as Windows 7, Vista and XP, etc. How will Window Clicker Work? Window Clicker will work on the concept of Windows. Software Screens, MessageBoxes, Error Messages and many more are treated as Windows. Each Window has some attributes so that the Operating System can identify it. 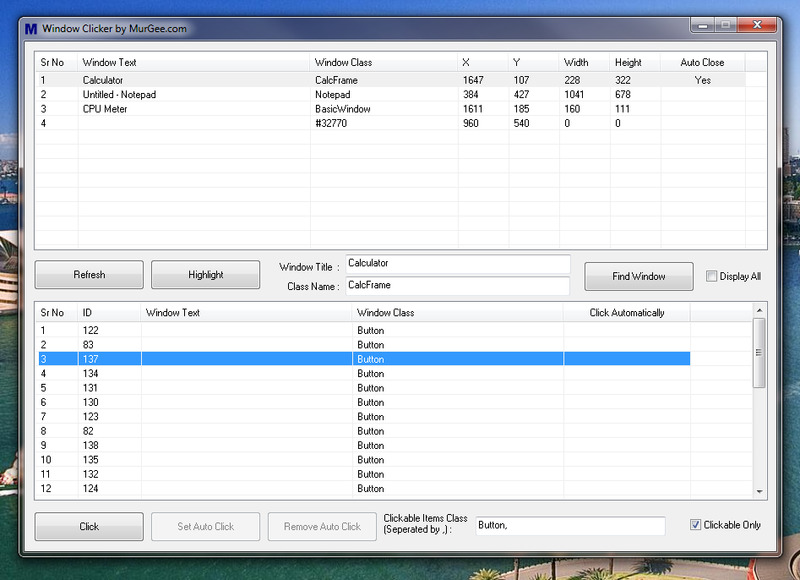 The Window Clicker will give you control and the required parameters to control Windows. You will need to identify the target Window, let's say target window is a Error Message Box. You will need to tell the Window Clicker Software that then this Error Message Box appears, close it or click on some specified button. Setting Auto Click on selected Window will allow you to concentrate on your work and let the Window Clicker click the configured window(s) automatically for you. You can even use the Window Clicker to close off popup windows, close error message boxes and much more. Just let the Software know about the Window to be clicked and the Window Clicker Software will do rest and yes in case a message box has more than one buttons, you will be able to specify which button to click automatically when that message box appears. Given below steps outline how you can use Window Clicker to Automatically Close a Window. All you need to do is identify the Window correctly and set it to Auto Close, and next time onwards the specified window will be closed automatically by the Window Clicker. Open the desired Window to be closed automatically. Now Open Window Clicker and carefully identify the desired Window in the Window List on the top list. Now Select the identified Window and double click on that, this will display a Yes in the Auto Close column of the Window list. Note : You can double click the Window Name again to remove the Automatic Closing of the Window. Note : You can even click on name Auto Close to remove all the automatic close tasks. Once you have set a Window to be automatically closed, the designated window will be closed automatically for you. In the Screenshot of Window Clicker, the Calculator has been set to Close automatically, so with the settings as displayed in the screenshot, whenever Calculator will be launched it will be closed automatically. Similarily you can identify a Window to be closed automatically by double clicking on the Window Name in the top listbox of the Window Clicker. In case you would like to reset or remove all Auto Close Actions configured, just click one time on the text Auto Close which is the last column of the First Window List at the top of Window Clicker. Once you remove the Automatic closing tasks, no window will be closed automatically by the Window Clicker. MurGee Home Offering Mouse & Keyboard Automation Software Downloads and more or have a look at Auto Clicker to keep the Mouse clicking and Auto Mouse Clicker to create a script to automate Mouse Clicks.